Caitlyn de Beer: Yoga, the journey of the self through the self to the self. Yoga, the journey of the self through the self to the self. 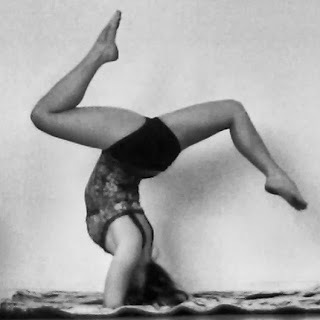 Today on Get Fit Friday, we have a guest post from Yoga-fundie, Chelsea Cardwell! When you hear the word yoga do you think ‘oh how boring’ or ‘I don’t have the patience to sit cross legged and chant OM’. I used to be one of those people. I initially took my first ever yoga class on a day I didn’t feel like working out that hard. I was absolutely shocked at how misled I had been when it came to this mind, body practice! Yoga is so far from a what I previously presumed, instead it is a full body workout that is both strenuous, stress-relieving and definitely gets your heart rate up. Some of the basic poses such as balancing stick; which you hold for 10 seconds is supposedly equivalent in energy consumption, to you running a 100m sprint. To share some of my own personal journey and all I have overcome, through the help of yoga, fitness and a general healthy lifestyle. For years, I battled with low self esteem and bad self image, that was until I discovered my love for keeping fit and healthy. Never have I felt so at peace with my life and fortunate for everything surrounding me, as I am and do now. I am far more confident and sure of myself, I know who I am and what I want and need in life. I am happy in every aspect of my life, which I can promise is not perfect but through yoga I have learnt to stop striving towards perfection. Yoga has changed my life which is why I am so thrilled to be sharing these yoga facts and benefits with you. Yoga is a mind-body practice and alternative medicine practice. Yoga brings together physical and mental disciplines to achieve peacefulness of body and mind, helping you relax and manage stress levels and anxiety. The best thing about yoga is that almost anyone can do it, no matter your age or fitness level. It can be done anytime, anywhere and the only thing you need, is a mat or a towel. My favourite place to practice yoga is on the beach; there I have a soft landing and beautiful surroundings. Where’s your favorite place to practice yoga?? The key to yoga is in the breath. Now that I am confident practicing some crazy pretzel-looking-poses, I find that if my breathing is controlled, I become focused and my body is balanced. Most people have little awareness of their breath, mainly due to it being subconscious but it is actually a secret weapon in life. Has anyone ever said to you, when you were nervous or stressed, “take a deep breath” and you did it?? And it really did help, didn’t it?? At the beginning of a yoga class that is what we focus on, breathing deeply through your nose filling your lungs and belly and then slowly breathing out again through your nose. Yoga has many different styles, forms and intensities. For example Hatha yoga, in particular, may be good choice for stress management. Hatha is one of the most common styles of yoga and perfect for beginners as it has a slower pace and easier movements and you can choose how much you want to push yourself. Balance in life is extremely important and the same goes for the practice of yoga. Everyone’s body is different, and yoga poses should be modified based on your abilities. Selecting an instructor that is experienced and attentive to your needs is an important first step to a safe and effective yoga practice. Regardless of which yoga you practice you do not have to do every pose. If the pose is too uncomfortable or if you can’t hold it for as long as the instructor requests, don’t do it. Good instructors will understand and encourage you to explore and not exceed your personal limits. So give yoga a go... a back bend could open your heart, a forward bend could ease your stressed mind and your first crow pose could make you feel like you are flying!